Caterfly’s Open Smart Transformation process can be used to implement new approaches to working, systems for achieving better results or to solve a common problem together utilising many minds to reduce blindspots and catalyse innovation. The first diagram illustrates a scenario where the implementation has to be staged, for example in larger companies or where the whole work force cannot be absent from operations all at once. In such a case the workforce would be grouped, with the transformation phases offset over time. This can be done in a number of different ways. The diagram shows the possibility of cross-referencing different groups, enabling people at different stages to intermix. We manage the participatory element that is critically missing from most attempts at introducing Environmental or Sustainability Management Systems (EMS ISO 14001 or SMS ), and which accelerates and amplifies its success. This second example represents such an implementation of a sustainability program. The organisation endeavours to meet various environmental requirements and become sustainable. The business has decided to implement a programme to comply to all new legal requirements and to achieve the SMS ISO 14001 Sustainability Management System accreditation. Because activities relate to local compliance, they tend not to be centralised or strategic. Organisations will experience varying degrees of resistance in the compliance phase (Phase I), as well as varying degrees of success. In most cases, however, organisations will find that this fragmented compliance approach costs money – ‘sustainability’ compliance eats into the business’ bottom-line. Businesses often seek outside assistance at this point. The goal of the next phase (phase II) is to break even, by increasing efficiency through lean thinking. Lean thinking would achieve both efficiency and cost neutrality as well as nudging sustainability compliance to a more strategic position. 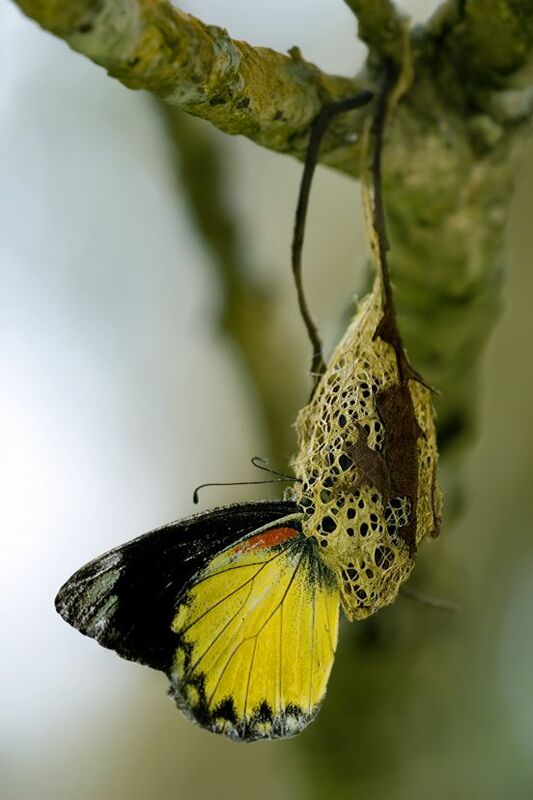 To facilitate the transformation to a lean organisation we would work with lean coaches and introduce the Caterfly process, inviting all affected onto the metamorphosis journey. If the business had not previously gone through Phase I, compliance, we would still jump straight into Phase II, because compliance would follow naturally from lean (note: compliance follows from lean, but lean does not follow from compliance, as lean is an integrated system approach). 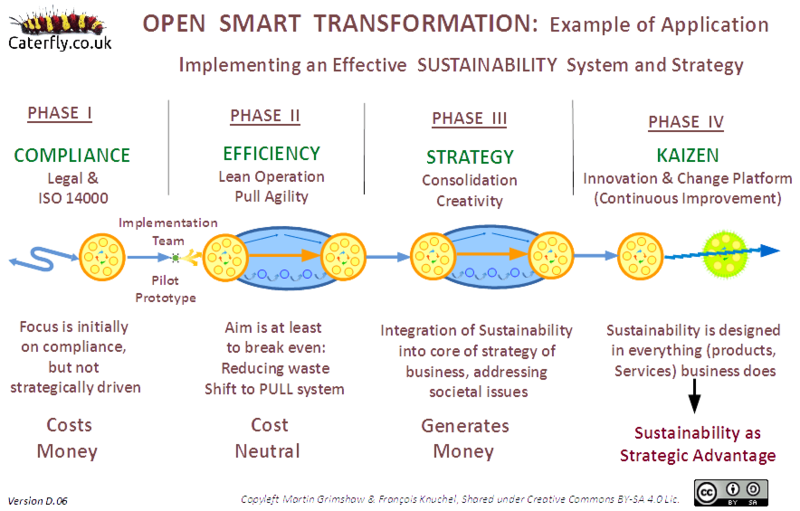 After the successful implementation of lean thinking some businesses may wish to stay there, in which case we would follow up in the usual Open Smart Transformation: phases I – III. Others may wish to go further and shift to a more advanced strategic stage, by integrating sustainability into the core of the business. Strategy would be driven by the market and clients or users with an eye on creating innovative product or service solutions which both satisfy and delight users as well as proactively address sustainability issues, solving both societal and environmental concerns. In short sustainability itself, rather than being a drain on resources, is now a source of profit and a strategic advantage. To move into this mode would require a second transformation, fully elevating lean to a new level. A second chapter of the Caterfly process is needed, again with the framing Open Space events, this time focussed more on strategic innovation. Building on the lean thinking foundation of how we deliver products/services efficiently and sustainably, the focus is now on how we create new products/services which are strategic and have sustainability built into them. And after this second chapter of the Caterfly process we would follow up with the usual consolidation and implementation of Kaizen culture. The aim should be an organisation that operates on an innovation and kaizen platform and creates and delivers products/services which are sustainable and actively contribute to the societal betterment. Because of the embedded Open Space and Kaizen culture (which the business continues to nourish without outside help) the organisation is highly nimble and responsive.